The Basil Miles Double Bicycle Bag is a spacious storage option for any cyclist. This bag comes with a pre-assembled adapter plate, allowing you to easily attach your bag to your carrier in seconds with the innovative MIK system. 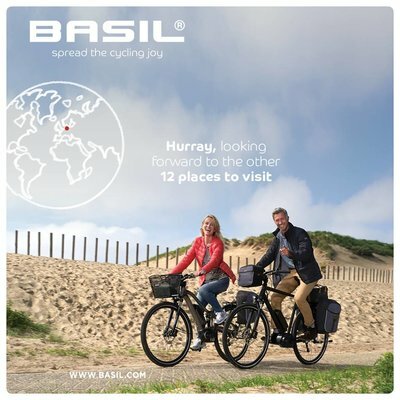 The Basil Miles Double Bicycle Bag is a sporty choice of storage for your bicycle and is suitable for both men and women’s bikes. This spacious bag has a total capacity of 34 litres, providing you with plenty of storage space for all your essentials. Made from hard-wearing polyester with quality linings, these bags are incredibly sturdy and built to last. With waterproof finishes, they’re also ideal for riding in any weather, keeping contents dry. Opening and closure is easy thanks to drawstring fastening and eyelets. The Basil Miles Double Bag is easily attached to your carrier in moments thanks to the integrated MIK adapter that works with any MIK system carrier plate. Easily mounted on your carrier rack, you’re good to go in moments. You can remove it from your frame just as quickly when you’re ready to move on foot. Furthermore, you can count on safety on the road thanks to highly reflective trims. Additional eyelets provide you with the option to add further LED lights should you wish. Looking for a stylish choice of bicycle bag that ensures you never have to skimp on what you can carry? The Basil Miles Double Bag is an ideal choice. Looking for something slightly different or keen to explore more enticing accessories from Basil? Browse our complete range online today. This double bike bag comes with a pre-assembled MIK adapter plate. This bag has a total capacity of 34 litres. Secure fastenings provide peace of mind. Reflective trims enhance visibility in the dark. Additional LED lights can be fitted easily thanks to convenient eyelets and loops. Simple mounting courtesy of the MIK system. Includes key for secure locking and theft deterrence.